57 St. Anne's City Park - Roblin Blvd. - Academy Rd. - Sherbrook St. - Broadway - Memorial Blvd. - Portage Av. - Main St. - St. Mary's Rd. - St. Anne's Rd. 59 St. Mary's City Park - Roblin Blvd. - Academy Rd. - Sherbrook St. - Broadway - Memorial Blvd. - Portage Av. - Main St. - St. Mary's Rd. 82 Corydon Lorette Av. - Stafford Av. - Academy Rd. - Sherbrook St. - Portage Av. - Main St. - Broadway - Osborne St. - Corydon Av. - Wilton St.
83 Stafford Wilton St. - Corydon Av. - Osborne St. - Broadway - Main St. - Portage Av. - Sherbrook St. - Acedmy Rd. - Stafford Av. - Lorette Av. 90* Park Line - McGregor University - Pembina Hwy. - Osborne St. - Memorial Blvd. - Portage Av. - Main St. - Selkirk Av. - McGregor St. - Luxton Av. 96* Park Line - Selkirk University - Pembina Hwy. - Osborne St. - Memorial Blvd. - Portage Av. - Main St. - Selkirk Av. - McPhillips St. 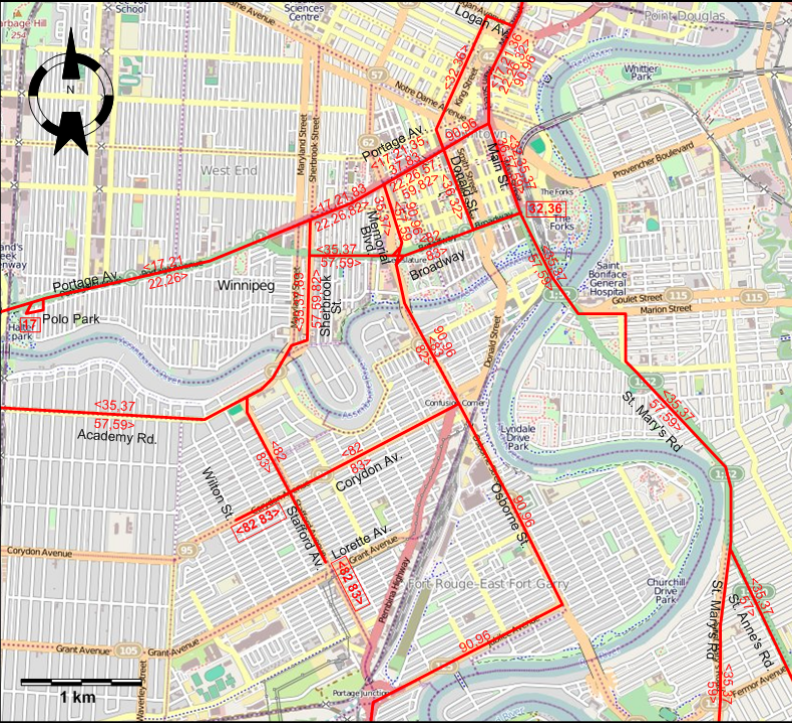 Note: Most streetcar routes in Winnipeg were unidirectional. Only routes 32, 36, 90 and 96, marked above with an asterisk (*), went in both directions. (Horse-drawn streetcars line): 5'6 1/2" (1689 mm. ); (Electric streetcars:) 1435 mm. Baker, J.E. 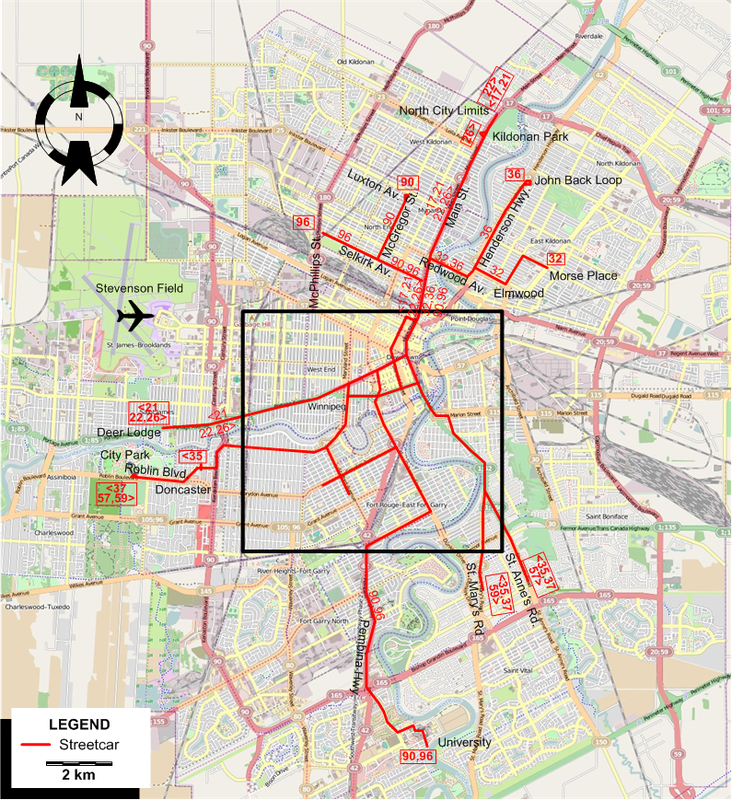 Winnipeg's electric transit: The story of Winnipeg's streetcars and trolley buses. Toronto: Railfare Enterprises, 1982.